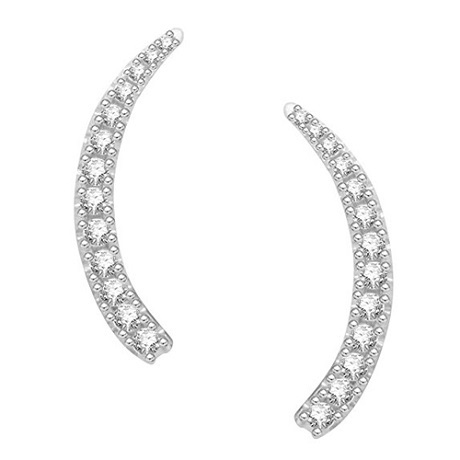 There's nothing quite like a pair of diamond earrings. Ornate, eye catching and incredibly beautiful, they add a final touch of sparkle to any outfit. The selection of a pair of diamond earrings should in theory be an easy choice. After all, no need to get the fit right like with a ring and no need to get the length right like with a bracelet or necklace; just stick them in your ear lobe and off you go. If only life was that easy. Earrings are the item of jewellery worn closest to the face. Consequently, though small in size, they make a big impact. The correct pair of earrings can enhance your features and the converse is also true. Earrings are a versatile accessory and are a perfect complement to many outfits and occasions. Earrings can be worn by both genders. When buying earrings for someone else, consider their style preferences and lifestyle. From classic and timeless to modern and chic, there is a pair of earrings for every taste and budget! The essence of class and elegance, our diamond earrings guide shows different styles that will be her favorite new accessory she won't want to take off. Hoop earrings are one of the trendiest accessories. Generally round or oval shaped, hoop earrings penetrate the ear with a post, similar to stud earrings or through a post that goes through the earlobe and then snaps into the backing. Both variations are equally secure. From classic to contemporary, from extra small to extra-large. 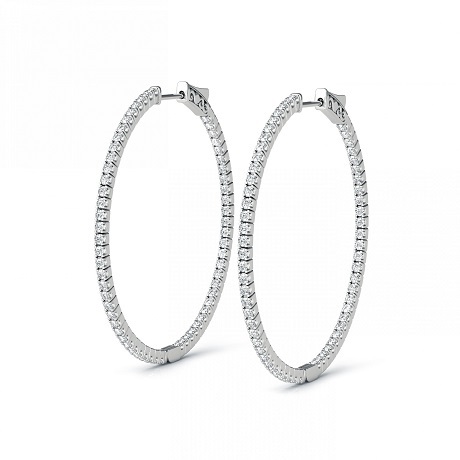 A single row hoop earring can be an elegant addition to any casual look while the double and three row diamond hoop designs are perfect for dressing up and special events. 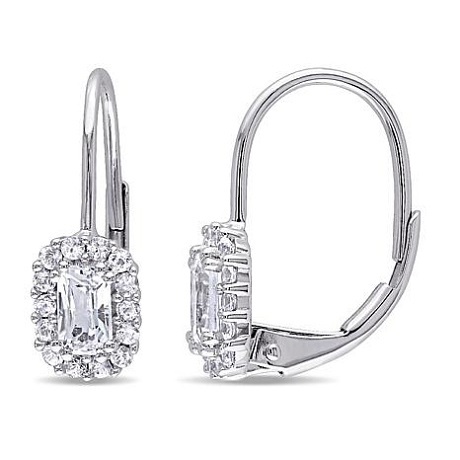 One of the newest diamond hoop earring designs is called the inside out diamond hoop. This style has diamonds set on the front and inside of the hoop so you can the sparkle from all directions. Are you looking to make a statement? Add color to your hoop earrings with the addition of gemstones. The alternating diamond and gemstone look is truly stunning. Drop earrings, or dangle earrings, are designed to flow from the bottoms of the earlobes. A drop earring can connect to the ear with a post (similar to studs) or a hook. Variations of the hook include the shepherd design, which snaps closed rather than staying open like a French hook design. The bottom portion of the earring dangles directly underneath the top. 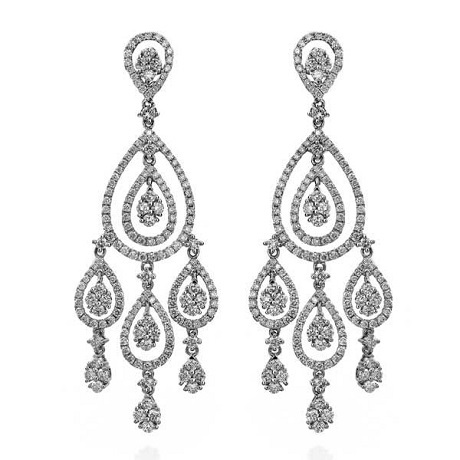 A form of drop earrings, chandelier earrings resemble the shape of a chandelier light fixture for which the style was named. Popular for both daytime and evening wear, this style usually contains gemstones for added drama and elegance. Ear crawlers, or crawler earrings, start at the bottom of your ear and "crawl" up the lobe of your ear. They can make a big statement and add a fresh update to your earring style. An jacket earring is an adornment for the ear that is an accessory to an earring. They are typically designed to be secured to the lobe with a stud. Leverback earrings allow you to wear a variety of earring designs comfortably and easily. They provide additional security to the standard post earrings since the lever holds the earring securely in place. 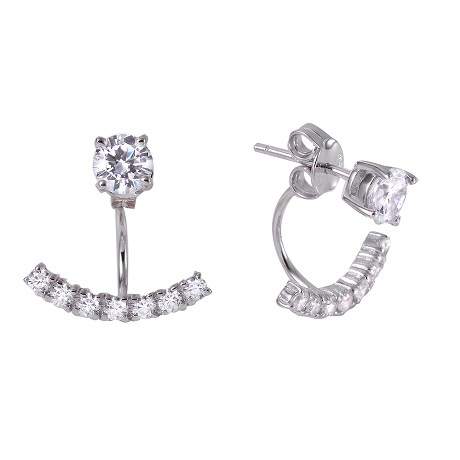 Omega back earrings have a hinge that is attached to the clip that flips up the back of the earring post. The clip is usually in the shape of a Greek letter Omega. 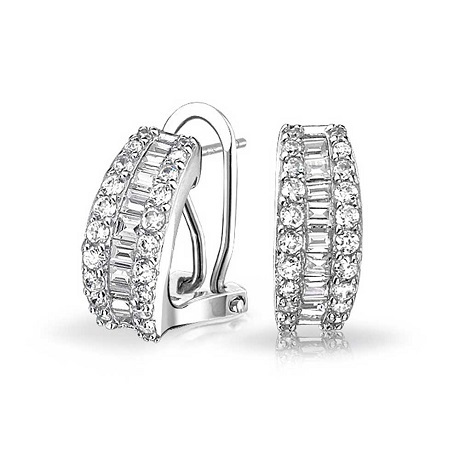 Omega backs provide security and ease of use for the earring and look best with small hoop earrings. Journey jewellery adds a personal touch and represent your journey through life and love. 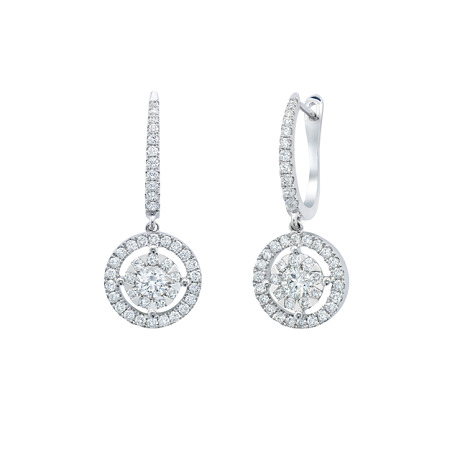 Diamond journey earrings add a touch of sophistication to any outfit. 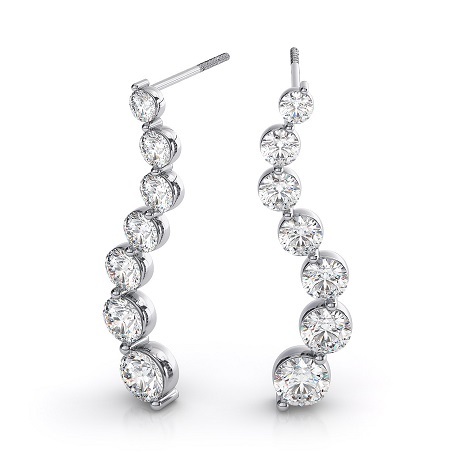 Some journey earrings have a graduated style, which means the diamonds grow in size from top to bottom. Other styles have an antique feel, with the addition of lovely milgrain edging around the diamonds. If you are interested in buying a jewellery set, diamond journey earrings coordinate wonderfully with a diamond journey pendant. Journey jewellery is a symbol of achieving success in life and love, and is a thoughtful graduation or anniversary gift. Celebrate your past, present and future with a pair of three stone diamond earrings. Three stone earring styles are usually horizontal and features three stones (either diamonds or alternating with gemstones). If you are interested in buying a jewellery set, three stone earrings coordinate fantastically with a three stone pendant necklace. Three stone designs have a classic look, with diamond graduating in size from top to bottom. You can also customize a pair with your favorite gemstone for a vibrant and unique set. Three stone earrings are great milestone gifts - perfect for an anniversary or birthday. 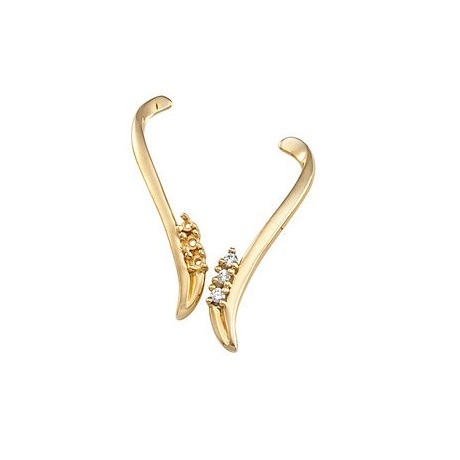 An earring style designed to follow the contour of the ear. This earring style can be plain metal in varying shapes and patterns or set with diamonds/gems. A single diamond (usually over 1 carat) set in a stud style is a simple, classical, timeless piece of jewellery that makes a classy, demure statement and is suited for most shapes. From the front view, stud earrings appear to float on the earlobe without a visible point of connection. Studs are always constructed on the end of a post, which penetrates directly through the ear. The post is either threaded and relies on a screw backing or is solid and has a push backing. For larger sized stud earrings, a screw back is usually preferred and can help prevent the loss of expensive earrings by keeping them secure. 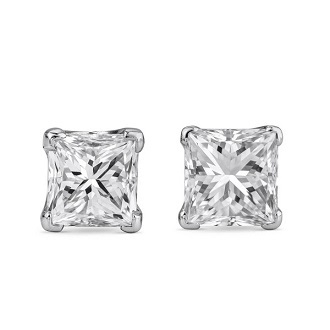 If a solitaire stud is a little too reserved for your taste, a pair of halo stud earrings may be more to your liking. Similar to a solitaire stud but in a variety of shapes and surrounded with a smaller pave or micropave diamond setting framing the center diamond. The addition of this halo of smaller diamonds enhances the brilliance of the center stone and gives an overall more flamboyant effect to the studs. Although they may be more dazzling than non-halo studs, halo studs are not too extravagant and give you the opportunity to play with different color diamonds for an extraordinary effect. They are also best suited to oval, long, or diamond shaped faces. Also, since the effect is greater, the center stone can be smaller than the norm of a solitaire stud. 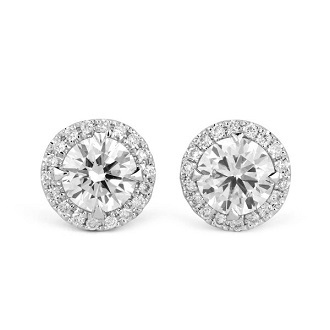 When choosing a pair of solitaire diamond studs, the size is the total diamond carat weight between the two earrings. 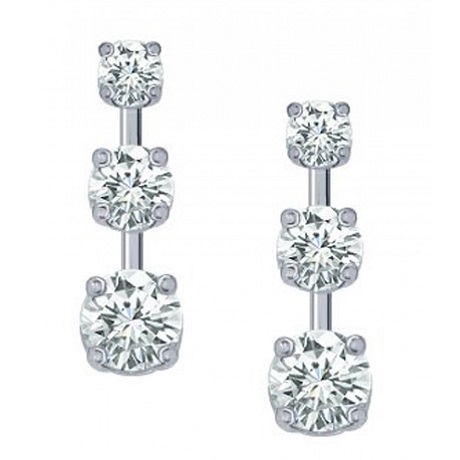 If a pair of studs is shown as 1 total carat weight, it would mean 1/2 carat (.50 ct.) per earring. For diamonds 1/2 carats and above it is more essential to look for a diamond quality that will balance the clarity and color. As a general rule, the larger the carat size, the better quality you will want to select as any flaws will be more visible to the naked eye as you choose a larger stone size. Earring backs have a functional, as well as an ornamental, purpose. Most customers may not be aware that earrings have different backs and that the back type helps determine the earrings' style and design. The earrings' back will determine whether the earrings are studs, set closely to the wearer's earlobe, or dangles, cascading off of the wearer's lobe. Earring backs also add diversity to a pair of earrings, transforming classic earring designs into more modern, contemporary earring styles. Earrings are fitted with a number of back types from popular safety backs to the contemporary push back. 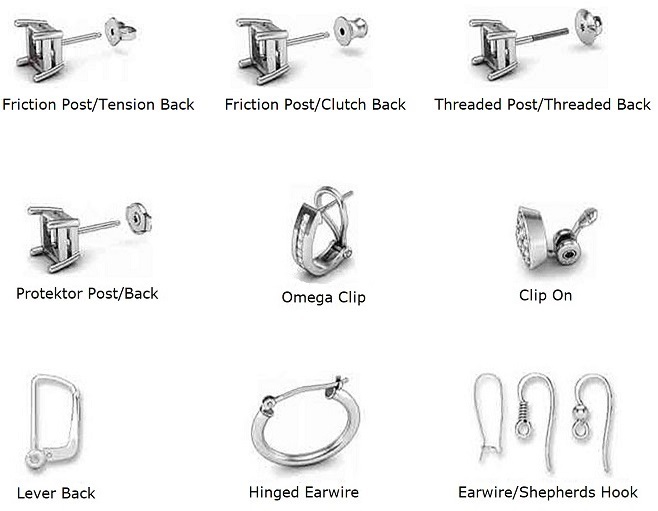 The three most popular earring backs include push backs, screw backs and safety backs. Also called the butterfly back, the push back is the most common earring back type used in stud earrings. Push backs feature a single ear nut which is pushed back onto the earring's post and held securely in place by tiny grooves etched into the post. The push back is easy to use and is favored by customers who are looking for durable studs fitted with a secure back. Screw backs are common in both stud earrings and in dangle earrings. This particular earring back is fitted with a tiny screw which is screwed down a threaded post and into the earrings back in order to secure the earrings to the wearer's lobe. Screw backs were made popular back in the 1950's and are famous for their vintage, or antique, aesthetics. Screw back earrings are favored for their durability and their unique appearance. Also termed Protektor or Alpa Nut earring backs, safety backs are known for their ability to secure even the most heavy weighing, large-scale earrings. Safety backs feature a positive-locking clutch designed to grip the earring post, thus holding the earring securely in place. The back is spring loaded, fitted with two tabs on both of its sides that are designed to allow for a quick release. The safety back is deemed one of the most secure earring backs and is perfect for any and every earring style or design. Friction backs feature two notches on the earrings' posts. The earrings' clasps are pushed onto the post and are held in place by the friction exerted on them by the grooved notches. Friction backs are perhaps the most common to be used in stud earrings and are favored for their durability and for how easy they are to use. Hook, or fishhook, earring backs receive their name from the hooked post which is threaded into the wearer's earlobe. Hook earrings are common in dangling earrings and are popular with customers who are looking for a simple, sophisticated earring back for their dangles. Leverbacks possess a tiny lever which opens and closes onto the end of the earrings' posts, thus securing the earrings in place. Leverbacks are more common in dangling earrings and are popular for their unique, elegant aesthetics.